Jared E. Alcántara received a 2013 Dissertation Fellowship for his project TOWARD AN INTERCULTURAL IMPROVISATORY HOMILETIC: THE PREACHING OF GARDNER C. TAYLOR. LI: Jared, tell us about yourself and your current work. JA: At present, I’m an assistant professor of homiletics at Trinity Evangelical Divinity School in Deerfield, IL, where I’ve been teaching since July 2014. I completed my PhD in homiletics at Princeton Theological Seminary in 2014. My wife Jennifer and I have three beautiful daughters, ages 8, 6, and 2. 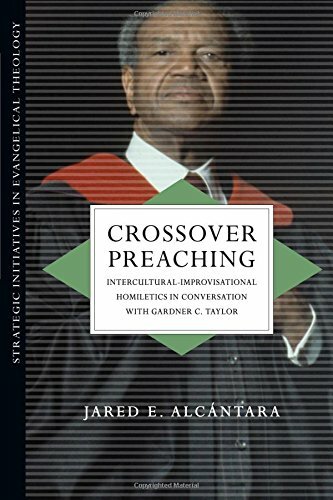 My first book came out in October: Crossover Preaching: Intercultural-Improvisational Homiletics in Conversation with Gardner C. Taylor (Downers Grove, IL: IVP Academic, 2015). I’m currently finishing the manuscript for my second project, Learning from a Legend: What Gardner C. Taylor Can Teach Us About Preaching (Eugene, OR: Cascade Books, forthcoming 2016). The first book is largely theoretical and is written for homileticians in the academy whereas the second book is half the length, it is largely practical, and it is written for pastors who may or may not have been to seminary. In the next couple of years, I’m planning to deepen my academic research in Latino/a preaching, and I’m hoping to publish a next-generation preaching textbook. LI: What core question/concern guided your dissertation research? LI: How has your dissertation impacted/framed your current ministry/work? JA: The guiding metaphor for my research was that of border crossing. Dr. Taylor was a border-crosser, a transgressor of racial, ethnic, and ecclesial divides. His willingness to cross borders has inspired me to do likewise in my research, teaching, and ministry. LI: What would you like us to know about your book Crossover Preaching: Intercultural-Improvisational Homiletics in Conversation with Gardner C. Taylor? JA: I’m excited that the time has finally come for this book to be released. It’s been a long journey for me. I started writing it (first as a dissertation) in 2011. A few thoughts come to mind as I reflect on the book’s release. First, Crossover Preaching is not intended to be a biography or a work of church history (although such projects on Taylor would be warranted and welcome). Rather, it’s an attempt at constructing homiletical theory in conversation with a particular person who embodied the proficiencies preachers and homileticians will need in an intercultural church with an intercultural future. Second, in this book, I attempt to do the work of a practical theologian by enlisting multiple conversation partners from a variety of disciplines. My final comment is that this book is not just written for African American preachers and homileticians who respect and admire Dr. Taylor. Everyone in my discipline needs to know more about who Gardner Taylor is, and why his preaching should matter to 21st century seminaries and churches. LI: Anything else we should know? JA: I’m so thankful to my friends at the Louisville Institute for granting me the Dissertation Fellowship in the final year of my PhD program at Princeton. Honestly, I don’t know how I would have been able to complete this project and provide for my family without the generous financial support, training, and encouragement I received from everyone. I’m truly humbled and grateful!